The beauty of genuine hardwood flooring combined with the ease of use of a patented click installation system makes this Power Dekor floor a true performer. Transform any living space quickly and easily with the warmth of authentic hardwood. This flooring is simple to install as no glue or nails are required. These richly coloured planks are available in a 5 inch width and random lengths of up to 48 inch. 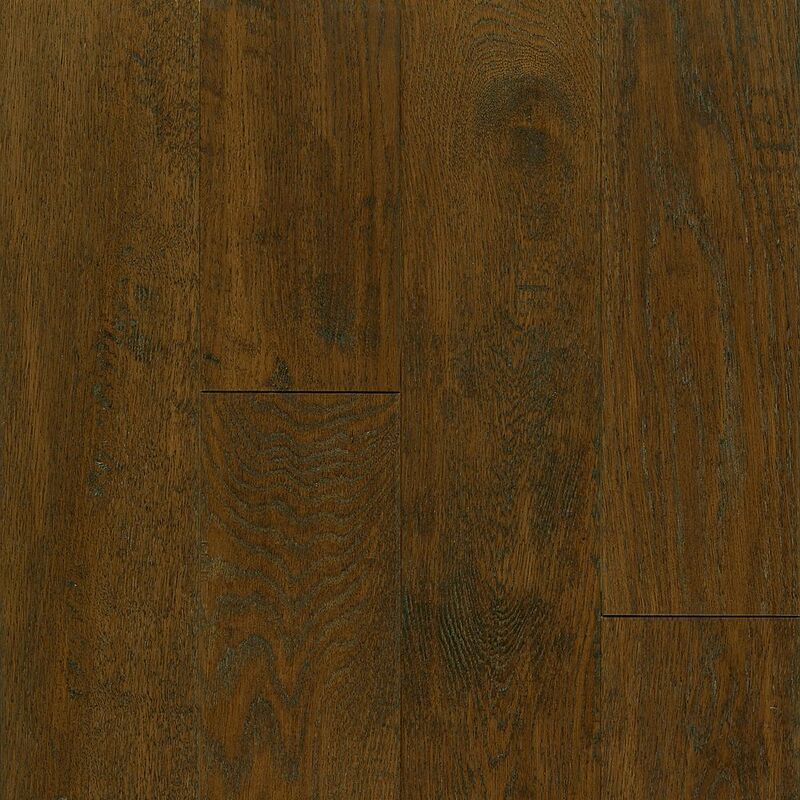 AV Oak Mocha 3/8-inch Thick x 5-inch W Engineered Hardwood Flooring (25 sq. ft. / case) is rated 4.4 out of 5 by 8. Rated 5 out of 5 by AF from Very pleased with the Bruce Mocha Scraped Oak engineered flooring.... Very pleased with the Bruce Mocha Scraped Oak engineered flooring. I was lucky to have hired a great person to install so the results are outstanding. Rated 5 out of 5 by Anna78 from The floor is super easy to install. I've never installed... The floor is super easy to install. I've never installed flooring before and I did it myself. It is pretty durable too- I've moved a lot of furniture across it with no damage or marks left. Overall I love it and it looks great! Rated 2 out of 5 by JM from Pretty disappointed in this flooring. We first put it in our closet and it looked great. Loved th... Pretty disappointed in this flooring. We first put it in our closet and it looked great. Loved the width and feel of the floor. We had an extra box left over so we decided to do our Master Bedroom with the hopes of doing our entire 2nd floor. We came back a few months later to buy 10 more boxes for our Master bedroom. Just installed it and It looks so chopped up. All the boxes were full of short pieces. Very few long pieces and several damaged pieces. Be aware if you are doing a large room that the majority of the pieces are short. Now we feel a little torn as to what to do about the rest of our 2nd floor. Rated 5 out of 5 by Engineered from Great Product This product is great quality, very easy to install, and looks beautiful. It is a little pricey, but compared to other products in its price range, I would say it is worth it. I damaged the floor slightly when moving new furniture into our house. I sanded the scratch smooth and applied matching stain and the floor is good as new. The only real downside is the lack of available transitions and stair nose. Those are VERY expensive and they do not sell a matching stair nose for the 3/8" engineered wood. I had to modify a stair nose made for 3/4" wood floor. I did not dock any stars for the transitions and stair nose as I am reviewing the flooring itself. I just wanted to point that out for those looking.